Betagen Spray is a prescription topical anti-inflammatory treatment used on dogs suffering from superficial lesions caused by bacterial infections of the skin. This quick and easy medication helps treat and relieve hot spots, rashes, skin infections, and allergies. Betagen Spray is FDA-approved and safe for dogs with sensitive skin. While serious side effects are not typical, extended use of Betagen Spray may result in the growth of organisms such as fungi and yeasts. Following the use of synthetic corticosteroids, some animals experience increased thirst and urination, vomiting and diarrhea, and weight loss. Talk to your veterinarian if you notice any unusual side effects. 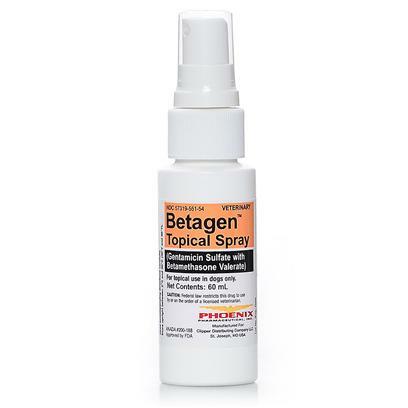 Do not use Betagen Topical Spray if your dog has a viral or fungal infection. Talk to your veterinarian if your dog is pregnant or lactating. Each mL contains: gentamicin sulfate equivalent to 0.57 mg gentamicin base, betamethasone valerate equivalent to 0.284 mg betamethasone, 163 mg isopropyl alcohol, propylene glycol, methylparaben and propylparaben as preservatives, purified water q.s. Hydrochloric acid may be added to adjust pH. Your veterinarian will inform you of the number of sprays per day and the duration of treatment. The usual dose is 2 sprays 2-4 times a day for 7 days. Do not use Betagen Spray for more than 7 days unless advised by your veterinarian. Prior to treatment, remove excess hair and clean the lesion and surrounding area. To use, hold the spray bottle 3 to 6 inches from the affected area.